A132 / E132N 6V alkaline batteries equivalent to Mallory TR132R TR132 Eveready E132N E132 EPX132 H-2P 2MR50 2NR50. Diameter: 17.0 mm. Height: 32 mm. 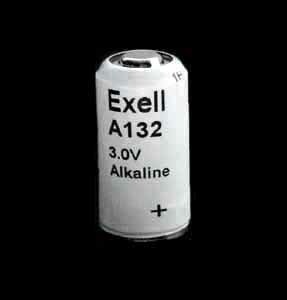 Also known as: A132 / TR132 / TR132T / EN132A / Duracell PC132A / H-2P/A / 2LR50. Three Volt Replacement for: Mallory TR132R / TR132 / Eveready E132N / E132 / EPX132 / H-2P / 2MR50 / 2NR50 / Burgess H132R. This A132 replacement for the Eveready E132N is an unusual battery typically used in industrial applications. It is a cylindrical battery with flat contacts at each end. The A132 is a mercury-free replacement for the once popular Mercuric Oxide Eveready E132N (or Mallory TR132R / TR132T) battery. Mercury cells are now banned because of toxicity and environmental fears. This A132 replacement for the Eveready E132N is alkaline and produces 3.0 Volts, which is a little higher than the 2.7V produced by the original mercury version. Most devices accommodate the small increase in voltage and function perfectly. This A132 replacement for the Eveready E132N is widely and successfully used in military night vision binoculars.. This A132 replacement for the Eveready E132N is a very hard to find battery. Consider buying more than one. These Alkaline cells have a shelf life of several years, so buy two and make sure you always have a ready supply of power for your industrial application whilst taking advantage of our reduced price multi-buy offer.